Hi everybody. Long time no see. I had visitors for a week, I got behind on Night Train, the kids got sick all at once, and here I am, with no posts for a while except my self-puffery, which I'm trying to avoid (but no one else will do it; see my dilemma?). I've been trying to restart my poetry engine by going back and forth between new-to-me poets and standbys. I'll have a short review or commentary on Drought Resistant Strain, poetry by Mather Schneider and possibly another, on an anthology called New European Poets, up on the blog soon. The latter will be a little slower in coming because I have to rethink my approach to 'criticizing' poetry, not just because of this book, but mostly. See, I'm ignorant of a lot of contemporary European poetry (among many other things), and it's so different in some ways from American poetry it's as if the two barely communicate--or have communicated--at all. And I want to communicate, in my own work, which is not the goal for some poets. I want the interplay of culture-clash and languages and class division, the red meat of the thing, whatever it happens to be. I want its skin off and guts on display so I can haruspicate. In short, I don't want to be ignorant of, well, anything, really, but poetry for sure. Dumb I can handle--not much choice in the matter-- redneck I was born with--but I sure as hell don't have to be ignorant. Anyway. 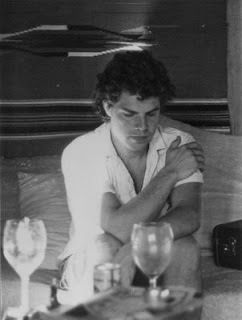 Below is my favorite Frank Stanford poem. I've posted it before but I don't care. It does everything I want a poem to do. P.S. after the fact: I'm not entirely ignorant of European literature. I have my own little obsessions, such as poets from the Russian-bloc countries of the Cold War, and some Soviet-era samizdat, thanks to a proselytizing teacher, Bernie Koloski, now retired from Mansfield University and the summer honors program I got kicked out of in the late 80s. But that's not much for a practicing writer and sometime academic.